Home > News > Machinery > Sheet and Plate > Bust the Myths – The Reasons Why You Can Justify a CNC Press Brake? Bust the Myths – The Reasons Why You Can Justify a CNC Press Brake? Most workshop machines work well and do what is required of them with a good degree of accuracy and throughput generally as fast as your operator can process them. But as businesses grow and feel the need for better accuracy or require a little more production capacity, many managers reach a point where they could perhaps use a Computer Numeric Control (CNC) machine. However, many struggle to justify the capital expenditure, particularly when considering relatively simple folding operations and low volume production. In most cases the main argument against such close-tolerance equipment is simply a financial one. 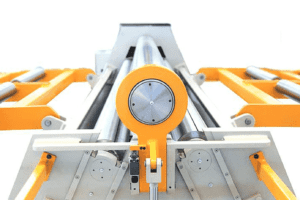 Many managers baulk at the perceived amount of time it takes to set up a CNC machine to perform what may only be a few simple folds. Added to that, the acquisition of new equipment means a learning curve for operators and the perception amongst many is that CNC programming is both difficult and time consuming. The key issues that many people seem to have with purchasing this type of equipment are fundamentally flawed, so let’s run through them. CNC’s are Expensive: Not True! 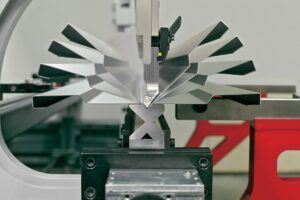 This may have been the case when the technology was new, and a top of the range CNC press brake may cost eye-watering amounts, but that doesn’t apply to all ranges which can be purchased for relatively small investments. Selmach offer a range of CNC pressbrakes that suit almost any pocket, so expense isn’t really an issue. Set-up Times are Long: Not True! This again was a major point at the inception of CNC equipment, but is now merely a myth. Modern CNC press brake are easy to program. 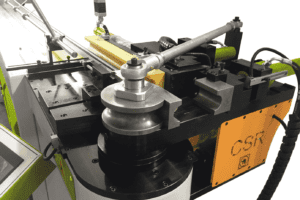 The setting up of a series of bends can be carried out a lot quicker than doing the same work on a manual machine, and once done, the program is stored in memory so it can be repeated at any time. CNC Pressbrake Training is Complicated: Not True! Modern CNC’s do not require a degree in computer software to be set up correctly and can in fact be programmed by staff with only a little training. Furthermore, most machines can import bend profiles directly from CAD data so if the drawing is accurate, the correct tools are in place and the metal is positioned correctly, then the bending process will be correct. On that note, there is no real reason not to consider a CNC press brake for small production work as they are now financially within the reach of most manufacturing companies. Instead of worrying about the cost, consider instead, your over heads and the cost of not investing. Look at your cashflow, particularly in terms of work flow. In most cases, ownership of a CNC press brake will increase productivity, and leave shop floor staff to carry out other tasks, which will have a profound effect on your throughput. Most importantly the CNC press brake can safeguard a workshop. Once a skilled operator has drawn, corrected and saved a programme, pretty much anyone can recall the programme and fold multiple parts. This will ensure that the company will not be completely reliant on skilled operators who will be inevitably become absent at some point through illness or annual leave. Consider the current costs of your equipment too. Even manual machines need to be maintained and as they age, parts begin to break and replacements become difficult to get hold of. 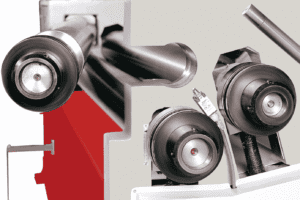 A major failure of your old, manual machine could halt production for a couple of weeks and that will have an enormous impact on your profitability, albeit a negative one! Selmach Machines offer a vast range of affordable CNC press brakes, and with bending capabilities from just 1.25 metres up to over six metres, you are bound to find a machine that can handle your work, that is quick and easy to set up, and won’t break the bank.